Some Microsoft Office files, including Word documents, Excel spreadsheets, and PowerPoint presentations, may not open correctly when coming from an internet location, especially from an email attachment or from Blackboard. To resolve this issue, you can disable Protected View within Office applications. WARNING: Never download or open a file from an untrusted internet source. If you are ever unsure if a source can be trusted, contact the IST Help Desk. Open an Office application (Word, Excel, or PowerPoint). 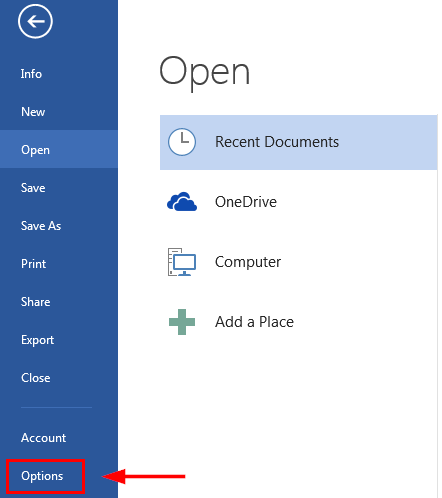 Open either a new document or an existing one. Click Trust Center on the left, and then click the button Trust Center Settings. Click Protected View on the left, and then deselect all the check boxes on the right. Click OK in each open window to close it. Repeat these steps for the remaining Office applications. NOTE: This procedure is profile-specific to each computer. If you log in to another computer, you will need to repeat these steps, and anyone else who logs into that computer will need to follow these steps for their own profile.